Fluotec has put together this StarMaker HP Weatherproof LED Bi-Color LED Panel Pack 2 with V-mount for image makers who need to take studio-quality lighting on the road. The pack contains two StarMaker Bi-Color HP Weatherproof Panels with gel frames, AC cables, stand spigots, C-clamps, safety cables, and two 8.8' light stands. A hard case is included for storage and transport. The V-mount StarMaker HP Weatherproof LED Bi-Color LED Panel from Fluotec is a versatile light source with solid core features. Its IP65 rating means that it's protected from rain or water projected from any direction. The StarMaker's 45-degree beam angle offers directional control for selective lighting and can be narrowed further by employing the included 30-degree grid. The light has an expansive color temperature range of 2700 to 6200K, making it easy to match other fixtures, ambient light conditions, or just for creative expression. Its high CRI rating of 97 is an indicator of superior, accurate color rendering. The StarMaker is also dimmable from 0 to 100% for instant changes in light intensity without moving the fixture. Ready for worldwide use, the StarMaker has a 90 to 240 VAC power supply, but can also run on V-mount batteries when mains power is unavailable. Besides the grid, the StarMaker comes with a gel frame, powerCON AC cable, and a stand spigot. 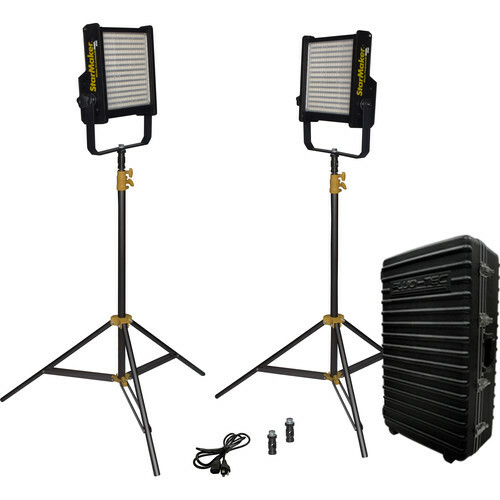 The 8.8' KS Light Stand from Fluotec is designed for use with StarMaker series tunable production LED panels. It has a maximum working height of 8.8' and minimum working height of 2.75'. Constructed from hard-formed plastic, the Multi-Light Case with Wheels for StarMaker HP LED Lights from Fluotec is designed to hold one or two StarMaker HP panels. The case has wheels and a handle for easy transport.